The RTL-sponsored Widnes Wild ice hockey team slumped to a surprise defeat in their last home game of the regular Laidler Division season as they were beaten 3-6 by a very well organised Sheffield Senators team at Planet Ice Widnes on Sunday. Despite out-shooting the visitors by 60 to 33 over the sixty minutes as a whole and dominating the game for long periods of time, nothing seemed to fall right for the Wild attack while the Senators seemed to put their own efforts away with comparative ease. An incredible 22 shots rained in on the Sheffield goal in the first period without success while the Senators managed just 7 on the Wild net, scoring from two of them. With several of the Wild players having played most of their early hockey in Sheffield, they knew most of the opposing team and this ensured that the game was littered with scuffles. The Wild had 4 powerplay opportunities in the first period alone – including a couple of spells of 5 against 3 – but were unable to break down the solid Senators defence. Widnes did eventually pull a goal back just 2 minutes into the second period through player coach Ollie Barron but two more from the Senators gave them what would turn out to be an unassailable lead. A second Wild goal late in the period – from Stuart Brittle – gave the home fans some hope but two more goals for the visitors in the third period killed the game off – and a strike in between from Wild’s Danny Bullock was not enough to inspire a late comeback. The defeat leaves Widnes in fourth place in the Laidler Division table with two games outstanding. They are already guaranteed a top four finish and a place at the end of season play offs, which will be held at Planet Ice Widnes over the weekend of 14th and 15th April. The two play off semi finals will take place on Saturday 14th April with one starting at 4.30pm and one at 7.30pm. The winners of each semi final will meet in the play off final on Sunday – 5.30pm face off. While the four teams involved have already been established – the Wild will be joined by league champions Sutton Sting, Hull Jets and Telford Tigers – the order of play will not be known until the league table is finalised. Telford still have an away game to play against Sheffield Senators on Saturday 31st April where a win would improve their final league placing and the Wild have asked the League Management Committee to rule on their two unplayed games – away to Hull and away to Deeside. The allocation of league points from that decision will also have a bearing on the final league positions. After the game, popular defenceman Lee Kemp was presented with an award to mark his 100th appearance for the Widnes Wild team. 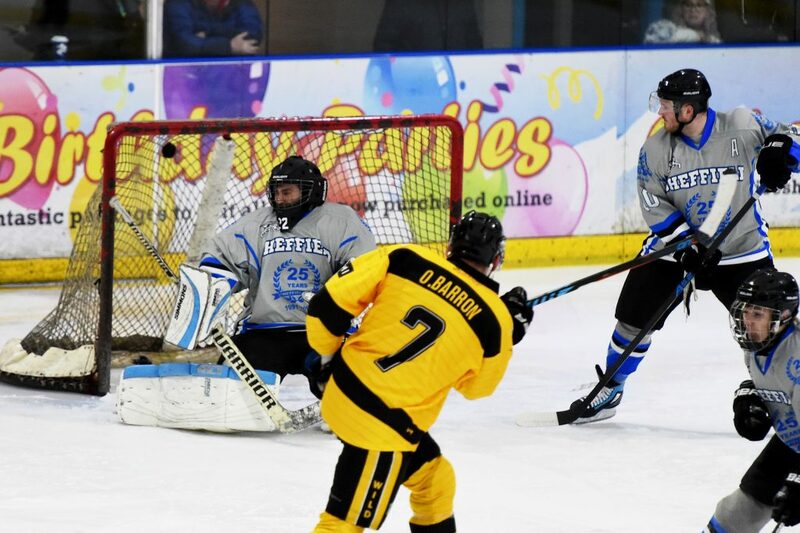 Kemp joined the club for the 2015/16 season having previously played for the Nottingham Lions and Peterborough Islanders in the NIHL and for junior clubs in his home city of Nottingham. The Halton Huskies recreational team lost 5-14 to the Solihull Grizzlies in a challenge game at Planet Ice Widnes on Saturday night. The Huskies have two away games coming up – against Whitley Bay Sharks on Sunday 7th April and away to the Solihull Grizzlies on Sunday 22nd April. The Riverside Raiders team play their first game of the 2018 Summer Classic Cup competition this Sunday 1st April at Planet Ice Widnes. The Raiders won the play off trophy last season and are hoping to defend their title this time around. The game faces off at 4.30pm and admission is free. A bucket collection will be made at the game in aid of two mental health charities MIND and CALM, in support of a charity game that is being played at Blackburn Arena on the same day in memory of Wyre Seagulls and Blackburn Falcons rec player Rob Craig who died last year.